This is another French example of a circus act on film, along with “Kobelkoff.” It is very different from the other Serpentine Dance movies we’ve seen up to now, in that it wouldn’t work as well in a constant loop, having clear beginning and end points. 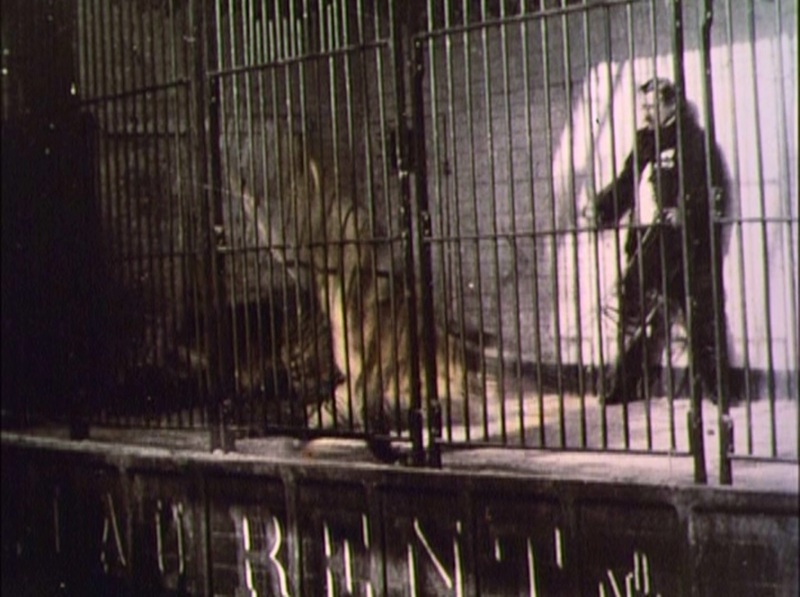 A lion trainer and two maned male lions are in a small cage. He cracks his whip and the lions run about on cue. He brings out a cow and keeps the lions back from it. There is another performance, apparently with different cats (possibly tigers, or female lions). Then the trainer goes backstage. When he re-emerges, the male lions are back, and he brings a woman in a hand-tinted dress. He has her stand back while he corrals the lions into a corner. Then she steps forward and waves her arms so that the dress creates flowing patterns. She dances before the lions, who seem mesmerized by the dress. Then, she steps back and the movie ends. The big surprise for me was that the “dance” portion of this movie only lasted about a quarter of its run time – just over thirty seconds. The rest was a pretty typical circus lion act, with the lions running up and down a small cage to the sound of their trainer’s whip. Note that he does not appear to hit the animals, the whip is used only as a sound cue. 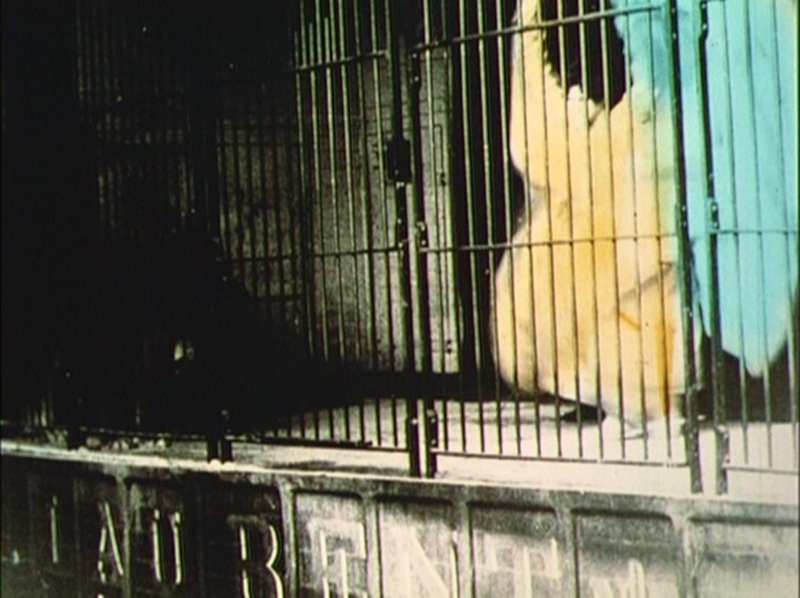 Animal rights proponents will still find the cramped conditions of the cage alarming, as well as the evidence of human dominance over wild animals. I felt a bit concerned for the cow, even though of course nothing happened to it. Because the camera was on the other side of the bars from the animals, I had a hard time seeing whether they were striped or not, especially when they were in motion. Imdb attributes this movie to director Alice Guy, but the disc I watched it on makes no mention of this. Similarly, I have been able to find no information about the “Madame Ondine” who according to the disc is the dancer.